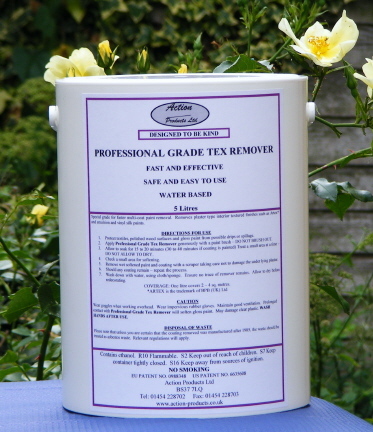 Professional Grade Tex Remover is a water based formula which soaks into emulsion paint, vinyl silk paint and Artex* type textured coatings on interior surfaces, softening them so that they can be easily scraped away. 2. Apply Professional Grade Tex Remover generously with paintbrush or sprayer. 3. Where painted, allow to soak for 30 to 40 minutes (50-60 minutes for ready mixed *Artex). Check a small area with a scraper. DO NOT ALLOW TO DRY OUT. Reactivate with warm water if drying occurs. 5. Apply a further generous coat of Professional Grade Tex Remover with a paintbrush or sprayer. 6. Allow to soak for 15 to 20 minutes (50-60 minutes for ready mixed *Artex). Where butyl rubber gloves to remove softened coating. Prolonged contact with PROFESSIONAL GRADE TEX REMOVER will remove gloss paint. Unless you are certain that the coating removed was manufactured after 1985, the waste should be treated as asbestos waste.